Love, love love these Bamboo Tower Chandeliers available in black, coral, green, red, white, they'll even do a custom color for you - swoon! Perfect for an entryway. I wish this little guy was wired for German outlets because I'd love to put something like this in my new pad. I have no clue if I could even find something like it in German stores, Bamboo and that whole Hollywood Regency thing is not a huge trend over there. Maybe it will take an American to change all of that, huh? Another nice find, this Jonathan Adler Ceiling Light, available in bronze or nickel, with that super geometric metal overlay... Simple but chic. 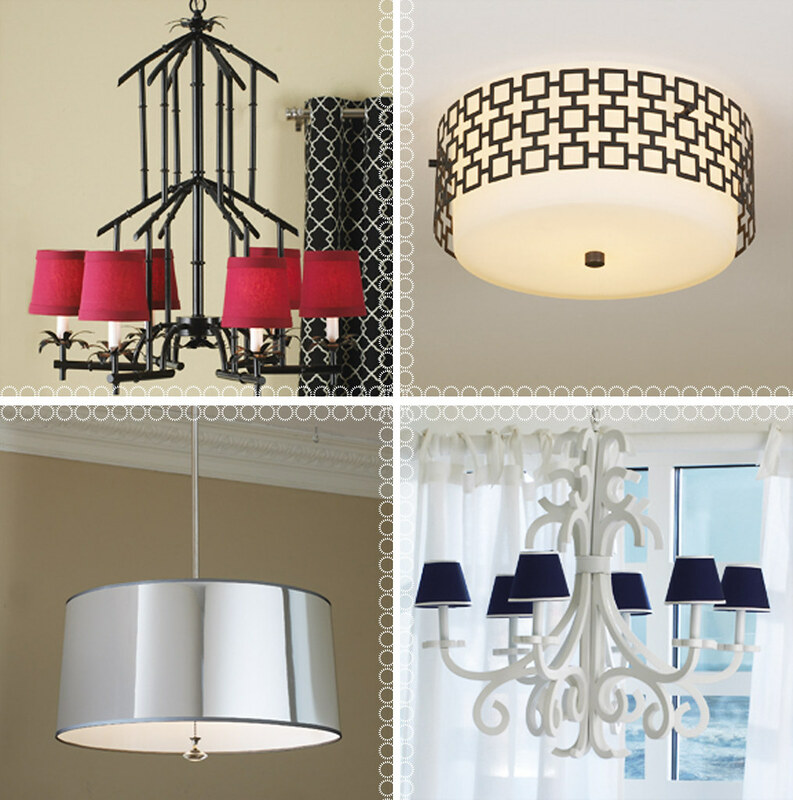 Modern, clean, the Dazzle Shade Chandelier is hot. Available in black, red, and silver. That reflective mylar is really sweet. The Simply White Chandelier has good bones. Not nuts about those shades, I'd either cover them with a fun Marimekko print or remove them altogether and let the bulbs run naked. :) I also may even paint this baby in some bright hue, turquoise, glossy black, lovely lime? Speaking of Jonathan Adler, if you're looking for an Adler-esque lamp for under $100, try the Saucy Ceramic Table Lamps. There are only a few left so if you like 'em, grab 'em. Not so sure I'm a fan of the trim on the shade but shades are a breeze to replace. I think I'd prefer a crisp white or to cover a shade with a great fabric. Like your patterns a bit subtle? This sleek tall Graphic Porcelain Table Lamp is nice, available in red or black. Again, more geometric patterns. I love seeing them on the base of a lamp. I'd like to paint a 4 poster bed in dramatic red lacquer, top with white duvet with a red border, add some yellow pillows and a patterned throw at the foot, and these lamps. I know, sounds odd but I love yellow and red in the bedroom. Another find I like is the Vintage White Milk Glass Table Lamp. How can one resist hobnail milk glass? Old-fashioned and pure. Another beauty in white is the Silhouette Urn Table Lamp. 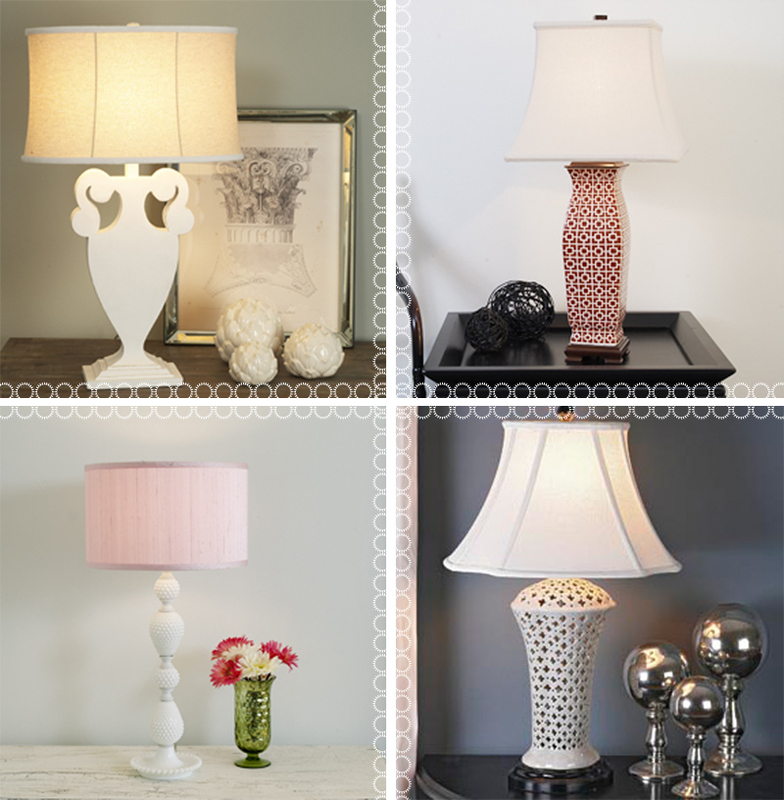 The Quatrefoil Ceramic Table Lamp is another good white find with a pattern. 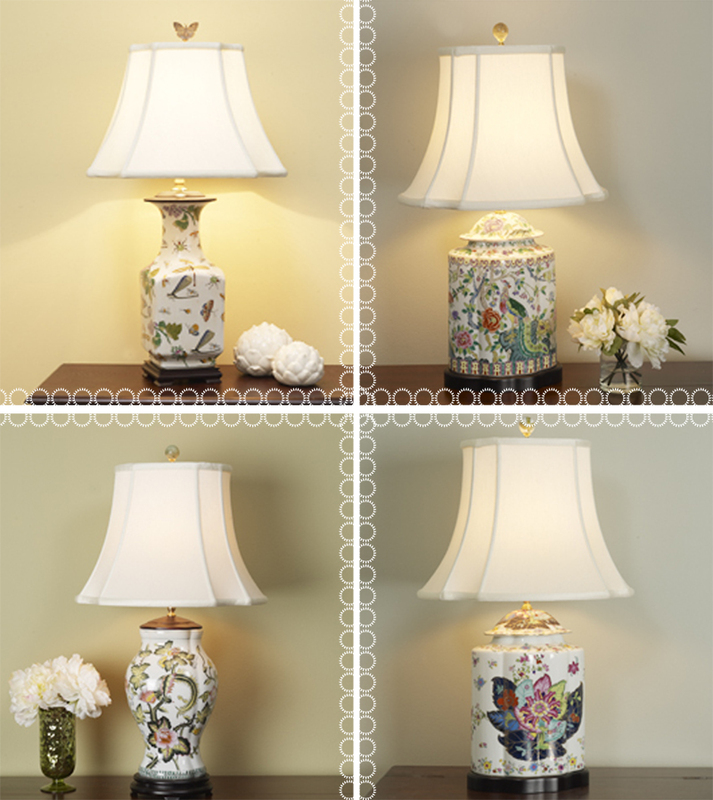 For something more traditional, I've always liked hand painted porcelain lamps. The Meadow Porcelain lamp is totally what my mother would have had in our family home growing up, she loved this look. You could use this in a room like the one shown below from a back issue of House & Garden. A few other beauties include the Peacock lamp, the gorgeous Tobacco Leaves lamp, and this lamp in a more Traditional Floral Pattern. Remember the Sofia Coppola house tour that was in House & Garden awhile back? I always loved her porcelain lamp shown on her windowsill.